The genus name "Gymnocalycium" derives from the Greek words “gymnos” meaning “naked” and “calyx” meaning “covering; calyx)” referring to the flower buds (calyx) bearing no hair or spines. (The genus name implies: “naked calyx”). no hair or spines but only smooth scale. 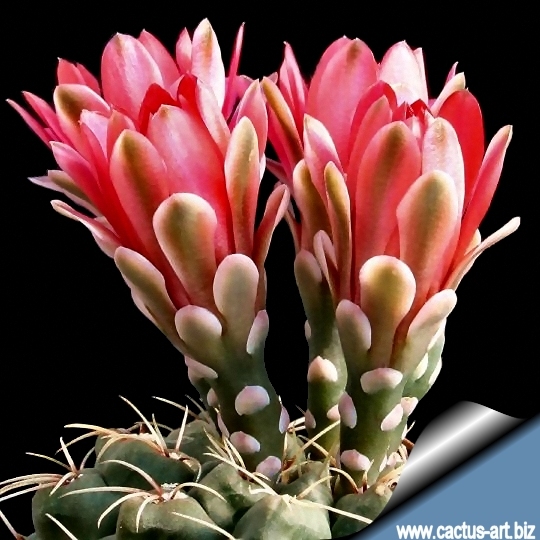 Gymnocalycium is a broad ranging genus of about 70 South American species. Their main area of distribution is Argentina, part of Uruguay, Paraguay and southern Bolivia a few species also occur as far south as Patagonia and a few occur into southern Brazil. Most species are globose, rather small varying from 4 cm to 15 cm (40 cm). They are very popular because they are easy to grow and easy to flower. The flowers are are generally brightly coloured white, greenish, pink, pinkish, red or occasionally yellow. Some are even quite frost resistant if kept dry. Most species are propagated from seeds that need 21°C minimum to germinate. Some species produces offsets that can also be used. Ripen fruits burst with a vertical crack. Seeds about 1 mm in diameter, spherical and truncated at the hilum end. Testa black, completely or at least partly covered by a brownish skin. Hilum round, margin delicate. Fruits and seeds get dry. Distribution: Uruguay, East Paraguay, South Brasilia and Northeast Argentina. Ripen fruits always turn green, bursting not always but becoming often softly and melting away. Seeds 1-3 mm in the diameter, almost spherical, something pressed together, noticeably broad in the proximity of the hilum. Testa black, more or some dull. Hilum prolonged and pressed a little. Hilum margin dark or bright. Plants variously sized, fruits burst vertically. Seeds small, less than 1 mm in the diameter. Little to medium-sized plants seldom exceeding 15 cm in diameter, very flat, most solitaire. Fruits spindle-shaped bursting vertically. Seeds up to 1 mm in diameter, like a mussel, hemispherical, pressed together, in the direction to the hilum wider. Testa bright shining dark brown looks as painted. Hilum ovate and basal. The bulge of the hilum is protruding very much. Distribution: Paraguay (Chaco), East Bolivia (Chaco), Argentina (San Luis, Córdoba, La Rioja, Mendoza, Catamarca, Salta, San Juan, Tucuman, Santiago del Estero, Chaco, Cordillera). Plant of different size and form; some species are small, other reach to 30 cm in diameter, some are flat, other become columnar whit age, mostly unbranched. Fruits spindle-shaped burst vertically . Seeds up to 1 mm in diameter, spherical or helmet-shaped as in Microsemineum. Testa light brown, dull, how dusts with cocoa. Hilum small, the border bulge a little whit a net cut.